Kadai paneer is an Easy North Indian Recipe made with Paneer and Capsicum. it is a Good accompaniment for chapathi,roti, Naan,kulcha,Mild pulao's and fried Rice.This is a dried version of Paneer recipe. kasoori methi - 1/2 tsp. 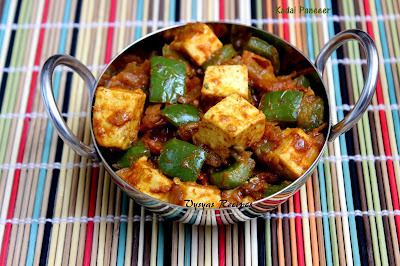 Cut the paneer into cubes, and keep it aside, if it is store bought,place it in hot water till usage. Chop the capsicum into pieces, shallow fry it and keep it aside.capsicum should maintain it's crunchiness. Heat the oil in the pan, add ginger garlic paste saute till raw smell goes.Then add onions saute till onions turns translucent. Now add chopped tomatoes, add chilli powder,Garam masala powder,coriander powder,turmeric Powder & salt mix well. 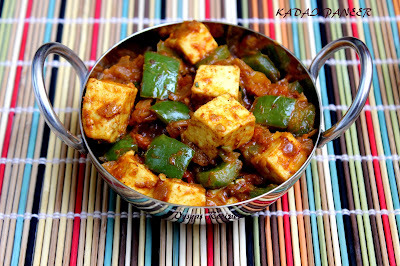 when the tomatoes turns gooey add 1/4 cup of water.When the gravy,starts boiling add shallow fried capsicum & cubed paneer. Mix well, till paneer and capsicum gets coated with Gravy. Garnish with kasoori methi by rubbing against your palms.Finally Garnish with Fresh Cilantro.Serve hot. It goes very well with chapathi, roti and pulao's . Shallow frying the capsicum gives crunchiness to Gravy. if it is store bought paneer, place it in hot water till usage. 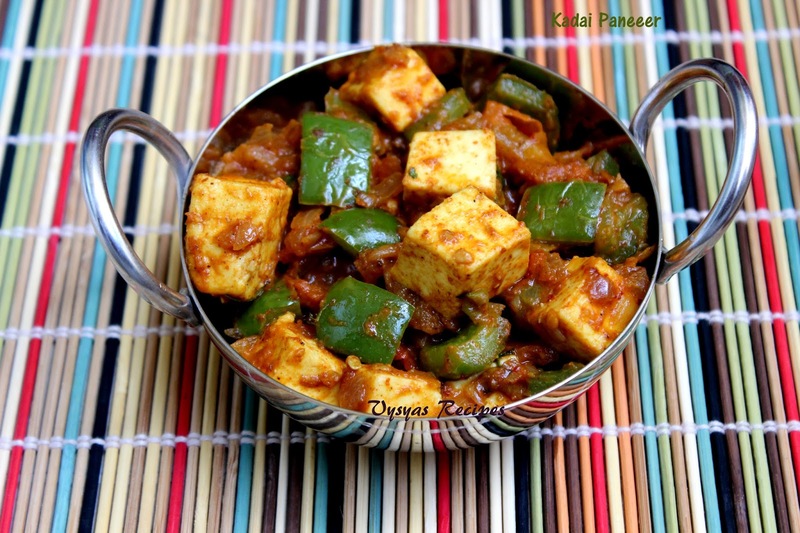 if paneer is soft,it absorbs the flavour well. Saute tomatoes till it turns mushy.